A Faygo toast to Lynn Bryer Skazalski, supervising librarian at the Caroline Kennedy Library in Dearborn Heights, Michigan, for putting this display together. She has significant help from Dawn Burch, Marketing Manager at Faygo Beverages, Inc., who sent over plenty of swag. 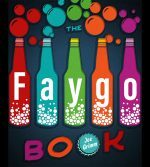 The library’s display is to let people know that I will be at the library at 7 p.m. May 7 to do a “Faygo Book” program. The library is at 24590 George Street. I have given about 60 talks and have scheduled about 60 more. The list keeps growing.